Interest in the history of Marvel Comics’ New Universe line of titles seems to be in the air. I’ve recently heard about several people seeking more information on the origins of the line. As an editor at Marvel during the birth of the New Universe, I can tell you that it was not an easy labor. Sometime during a 1985 editorial staff meeting, then Marvel Editor-in-Chief Jim Shooter announced a new publishing event – the New Universe* -- to help celebrate Marvel Comics’ 25th anniversary. What Shooter proposed at that meeting differed substantially from what eventually emerged. -They could cover any genre or time period and did not have to share continuity with any other title in the New Universe line. The editors were informed that any solid concept with commercial potential would have a reasonable chance of being approved. Celebrating the anniversary of the Marvel Universe with a publishing event that ignored the Marvel Universe seemed rather odd to me! It didn’t seem to bother Shooter. Around this time, my writer on Doctor Strange, Peter B. Gillis, approached me with his idea for a science fiction series set in the future. It focused on an ever-changing band of short-lived super-human fighters who defended Earth from an alien horde. At that early point, there was no hint that Shooter would take a very heavy editorial and creative hand in the New Universe. Gillis and Anderson began work on the book and I was very happy with the results. *** After some weeks had passed, I became aware that Shooter was calling New Universe editorial meetings that I was not being invited to. I visited Shooter’s office to see what was going on. The EIC informed me that he’d decided to alter the concept for the New Universe, making it a group of interrelated titles anchored in a shared universe that had no connection to the Marvel Universe. These books would have a very limited “fantastic” element to them and focus on how the characters responded to that fantastic element. Shooter was now up to his eyeballs in the development, creative work and production of the New Universe titles. There was also a growing negative mood around the office from many of those working on New Universe. Shooter often overturned the creative decisions of the line editors causing much consternation for the editors and their freelance creators. My biggest concern about Strikeforce: Morituri leaving the New Universe was making sure the book got promoted properly. Much of Marvel’s marketing resources for the year were focused on the New Universe, This could shortchange the marketing efforts for non-New Universe tiles coming out during that period. Bet you wish you had one of these ultra-rare 3D New Universe countertop displays! The New Universe was previewed for the fans in a dedicated room at the 1986 Chicago Comic Con. The walls were covered with art from the upcoming titles. I watched the reactions of the fans visiting the room. Few seemed impressed. The main bright spot for the fans was John Romita Jr.’s Starbrand art. So, Strikeforce: Morituri was launched in ’86 under the Marvel Comics imprint and any association with the New Universe was forgotten. Whether or not Strikeforce: Morituri took place in the Marvel Universe was left somewhat ambiguous. Strikeforce: Morituri went on to have a decent run from ‘86 to ’90, and, at one point, was optioned for a TV series by Sci Fi Channel. The eight titles that made up the New Universe also launched on ’86. The line lasted until ’89, almost as long as Strikeforce: Morituri. 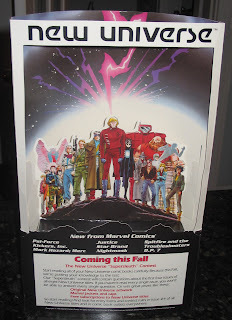 When Shooter was fired from Marvel in ‘87, the New Universe line was revamped. Some of the creators involved in the changes truly wanted the line to succeed. Others seemed more interested in getting their kicks by sinking their claws into Shooter’s baby. The New Universe name always bothered me. Using the term “New” as part of a title or brand is a bit awkward. While putting “New” in a blurb on a product often helps it get some initial attention, you can’t keep the “New” on the packaging forever. Assuming that you plan for the product to be a success, how do you justify the “New” when you’ve been around for years? If the New Universe had been in continuous publication for two decades, a 20th anniversary for the “New” Universe would have sounded even stranger than it did. It’s better to use terms like “new” and “improved” in temporarily blurbs on a product instead of incorporating them directly into the brand name. Otherwise, on some level, it seems like there is no expectation that the product will have the longevity needed to outlive its newness. **I recall considering another Gillis concept about the medieval Crusades but can’t remember if that project was submitted for consideration as part of the New Universe. *** Whicle Portacio made his first appearance in a Marvel comic as a penciller in Strikeforce: Morituri #1 where he drew several pages of a comicbook-within-a-comicbook. Up to that point, Whilce’s professional work for Marvel had been as an inker. ****I did eventually end up editing one New Universe title. Kickers, Inc. had the dubious distinction of being the latest title at Marvel. The series creators, Tom DeFalco and Ron Frenz, had left the series early on in its run due, at least in part, to Shooter’s heavy-handed involvement. Since the books in my office were on schedule, Shooter told DeFalco to inform me that I was the new editor of Kickers, Inc. and I was to get it on schedule ASAP. Making DeFalco force feed me DeFalco’s own now-corrupted creation was a pretty severe move on Shooter’s part. I felt bad for Tom. I did get the book on schedule just in time for it to be canceled (along with several other New Universe titles). *****Marvel’s Epic Comics line was doing a lot to expand the genres and subject matter that the company published but Epic didn’t get the promotional attention from the company that the Marvel titles did. Most of Epic’s titles were creator-owned. The company saw little reason to pour marketing resources into titles they didn’t own and fully control. This is a faulty line of reasoning and the subject of a future blog entry. NOTE: A number of you have sent in great email comments. If you feel comfortable doing so, instead of emailing me directly, post your thoughts in the comments section (link at the end of this post) so others can see the brilliance of your insights. I loved Strikeforce Morituri and the work that Gillis and Anderson did. I still have all the issues and periodically take them out and re-read them. They would make for a great movie or even a TV show. As a creator who worked on an Epic comic (Tomorow Knights), I can attest to the lack of PR for the line. I knew Steve Saffel, head of Marvel PR at the time, and went to him to discuss the issue. He confided the following publishing truism to me (I'm paraphrasing, of course): "If I have a limited budget, and two projects come up for PR, the one that I know is going to sell the best is going to get the most money spent on it. That way, when the higher ups review my spending compared to sales, I look like a genius." In other words, since a John Byrne mini was coming out the same month as my book, I was out of luck, his book was going to get all the PR bucks. Succinct and fair, Carl. But you left out any mention of the promotional Starbrand temp tattoos fans were supposed to plaster to their hands and triumphantly wave around in adoration! To Roy's point, Steve's fractured logic on promotion was at the core of the company's view of how or even whether to push Epic published properties. Hi, D.G., how's it going? To be fair to Saffel, I don't think he invented this approach, I have heard this is a fairly common practice in publishing. I had a bigger problem with Marvel's one other PR guy, the "naturally talented" Fabien, who was much more interested in launching his writing career than doing his job. And at the risk of sounding like a backstabber, I liked both of these gentlemen personally, but I don't think some Monday morning quarter-backing is out of line here. I can appreciate Steve or whomever's position better now, than in the thick of things. But what there was never any flexibility on was how to creatively use that limited budget. One poster for Moonshadow was never going to compete with the full blitz of whatever merry mutant was the "official" showcase of the month. But that was "all we can do." I remember having a conversation with Steve about all these enthusiastic fans having nightly conversations about Marshal Law on this thing called "GEnie." You hooked up with it via your computer and a phone line. "Maybe we should jump on this, put some official presence there, no one else is having this kind of dialogue with the readers in this space." "Well, Dan, that's an interesting idea...but I can't see how that's going to go anywhere. Why don't you leave promotion to the professionals?" LOL. While we're on the subject of Epic, here's another little anecdote that gives more clues to Epic's demise. When Tomorrow Knights #1 debuted, Rod Whigham & I did a number of shop appearances. At one place in GA, the shop owner was none too friendly. The appearance went well, all the copies of TK 1 sold, and I tried to chat up the grumpy owner. I asked him if he'd consider reordering more copies of TK 1. He looked at me as if I were insane & replied, "Oh, hell no! I'm just glad we got rid of all those! That Epic crap never sells!" Seems to me, in hindsight, as if Morituri definitely benefitted from the decision to sever it from the New Universe operation and treat it as a stand-alone series, whatever other mistakes were made or seen to be made. Thanks for the insight on this. Dan: I remember GEnie, albeit second-hand from my animation professors and Joe Straczynski's tales of his days there posted to Usenet once upon a time. That place was really ahead of the curve of the day, wasn't it? Wow... This is like a chatroom of comic vets from simpler times. Just want to drop a line about how much i enjoyed Strikforce: Morituri.